I have read the books, sat in multiple training events. I have heard stories, told those stories. I have defended church planting movement principles and believe that we are all called to make disciples, all called to be obedient and to teach others to obey Jesus too. I picked up life and packed my bags to move to a new country, new culture and learn a new language because I knew this was what God wanted me to do. The vision of worshipers of Jesus spreading throughout all of western Cambodia and all of Southeast Asia has captured my heart. But honestly? I am not good at learning language. I am slow at getting to know people. I confess I all too often give in to fear instead of stepping out in courage. I have let it all be about me, my own strength or lack of it. When I make my list of “what ifs”, I wonder, “What if I go home and haven’t started a movement? What if I go home as a failed missionary?” I could never be the pioneer who blazes into unknown territory, walks up to the person of peace, immediately begins a discovery Bible study and sees the birth of a church, all the while praying and seeing people healed of disease and casting out demons. I could never be the textbook church planting catalyzer, and am amazed by those who are. So, we went to Rattanakiri to meet with two missionaries who are seeing churches planting churches to the 3rd generation and almost to the 4th. People across the province are hearing about Jesus and following after Him. I got to meet leaders from these churches and visit some of their meetings. I got to hear stories from the missionaries who are investing their lives for these people. And you know what? They are some of the sweetest, most humble and fun people I have met. They are not “superstar church planters” but are seeking to be intentional and obedient. They freely admit that sometimes they have felt like they are stumbling in the dark, that there are things they would do differently. Some churches haven’t made it, some aren’t making disciples yet, others have had interesting issues of internal division. None of what I saw was the perfect, textbook case. And yet, God is moving in a powerful, amazing way. He is healing and giving release from spiritual oppression. He is overcoming all odds to be worshiped in this area. He is using the missionaries and giving them favor with people in high places. Yes, it is messy. But the thing is, thankfully, it is all about God. He is the one who is making things happen and He is the one who will receive all the honor. It was so freeing for me, to be honest. I do not have to be “textbook perfect” like I have let myself think. 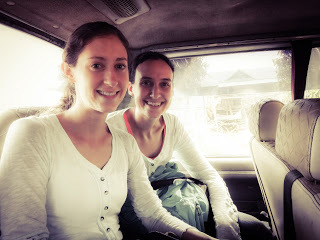 Perhaps God will use Kristin and me to be part of something like He is using the missionaries in Rattanakiri and I hope He will. I want to do my part in continuing to press close to Him, recognizing my weaknesses and not leaning on my own strength. I want to learn more about what it means to be obedient and make disciples in a Cambodian context but not wait until I have everything figured out and can follow some method or formula. I am thankful that I serve a God who is bigger than that and can use even me to accomplish His purposes.